The Smart Cities group focused on how cars could be better adapted to get round familiar problems of city life, namely congestion, pollution and parking. Motor companies are well aware of the issue. But the group felt the companies had missed the point, even with city cars such as the Smart, the iconic two-passenger cars introduced by Swatch and Mercedes in 1998. "We have to think of city cars as not just small-footprint vehicles that can squeeze into tight spaces but ones that can work in unison and also be almost like a parasite that leeches on to mass-transit systems," says Mr Chin. While Smart changed the way people think about parking and size...So the MIT team started from scratch to come up with their own concept: a stackable, shareable, electric, two-passenger car. "Imagine a shopping cart - a vehicle that can stack - you can take the first vehicle out of a stack and off you go," says Mr Chin. "These stacks would be placed throughout the city. A good place would be outside a subway station or a bus line or an airport, places where there's a convergence of transportation lines and people." On Vancouver City planning commision we have toyed with these ideas, thinking of having ideas and design compeition but moving up to 4.5 persons/LUV mobile (Light Urban Vehicle). 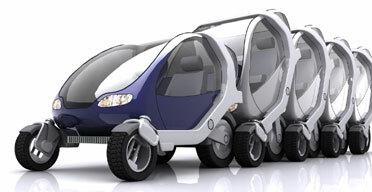 Yours might fit the bill by having a 2 wheel double hitched seat pod on back to cover kids and groceries in urban areas. The idea is to get rid of present heavy vehicles from city streets, you rent them or own in groups for the odd trips to the outback or intercity travel, or take a train. We are aiming at post cheap oil era which is not far off; higher densities of living, fewer car trips needed, by both choice and necessity.